Take the MBTA Green Line to the Arlington station stop. 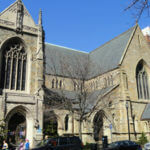 Upon exiting the station, walk down Berkeley Street towards Newbury Street. Cross Newbury Street and turn right. The church is half a block down on the left. Take the MBTA Red Line to the Charles/MGH station stop. Upon exiting the station, walk down Charles Street towards the Boston Common. At the end of Charles Street, cross Beacon Street and walk down Beacon Street to the right; the Boston Public Garden will be on the left. At the end of the Garden, cross Arlington Street and turn left to walk down Arlington Street. Turn right onto Newbury Street. The church is half a block down on the right. Take Route 93 North to Exit 26 and follow signs to Storrow Drive West. Take the Copley exit on the left and turn left at the traffic light onto Beacon Street. Take an immediate right onto Arlington Street. Take the third right onto Newbury Street. The church is half a block down on the right. Take Route 93 North to Exit 18, Massachusetts Avenue. Follow the signs to Massachusetts Avenue and turn right onto Massachusetts Avenue. Continue straight past Symphony Hall and Berklee School of Music. Turn right onto Commonwealth Avenue. Follow Commonwealth to the end and turn right onto Arlington Street. Take the next right onto Newbury Street. The church is half a block down on the right. Take Route 90 East to Exit 22 towards Prudential. Surface onto Huntington Avenue and continue straight through the light. Stay in the right lane and turn right onto Massachusetts Avenue (Symphony Hall will be across the street to the right). Follow Massachusetts Avenue past Berklee School of Music. Turn right onto Commonwealth Avenue. Follow Commonwealth to the end and turn right onto Arlington Street. Take the next right onto Newbury Street. The church is half a block down on the right. There are several parking lots and garages within a block of the church, including the Boston Common Garage.